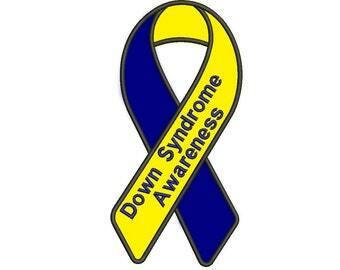 October is Down Syndrome Awareness Month. It is a chance to spread awareness of the abilities and accomplishments those with Down Syndrome have achieved. It is not to celebrate the disability but it celebrating the abilities. It is also about learning exactly what Down Syndrome is many do not truly know. John Langdon Down a physician in 1866 determined Down Syndrome as a disorder. He was not truly aware how Down Syndrome arises. It was not until 1959 that Down Syndrome cause was discovered to be a genetic disorder and the most common cause of cognitive impairment. Those living with down syndrome have improved life spans of 60 years in 1983 the average lifespan of a person with Down Syndrome was 25 years. Most children with DS function in the mild to moderate range of cognitive impairment. Those living with Downs often have physical and intellectual delays from birth. Many living with down syndrome can now live independently on their own as adults. A few have decided to get married and live as a couple. Individuals with Down Syndrome were once institutionalized this no longer happens. Americans with Down Syndrome have the same human and civil rights as all other Americans. Many individuals with downs will graduate from high school and go onto to college and some have received graduate degrees. Work, Volunteering, and voting are all things that we (ALL) can look forward to as adults. 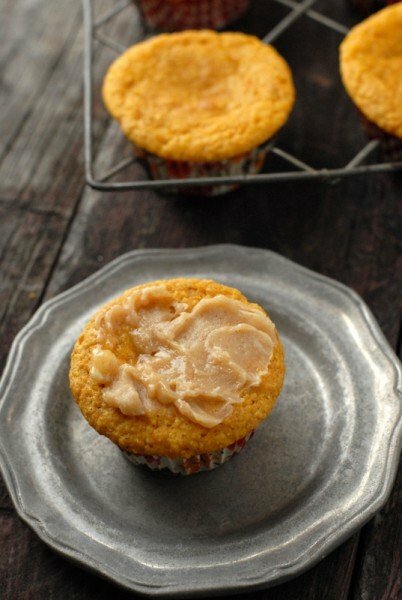 These muffins bear the familiar grainy texture of traditional cornbread, with a light pumpkin flavor and color. Paired with the sweet, seasonal whipped butter and your meal will hearld the flavors of fall! Preheat oven to 350 degrees. Line a muffin pan with muffin baking cups. In the bowl of a freestanding mixer (or in a large mixing bowl if using a hand held mixer) combine the cornmeal, flour, sugar, masa harina, baking powder, baking soda, salt and pumpkin pie spice. Mix on low to fully combine. In a separate large, mixing bowl combine butter, buttermilk, sour cream/crème fraiche, egg and pumpkin puree. Whisk to fully combine. Add the wet ingredients slowly to the dry ingredients, mixing on low to fully combine. Do not over mix. Fill muffin cups 2/3 full and bake for 20-25 minutes until a toothpick inserted comes out clean. Allow to cool in pan for 15 minutes and then on a cooling rack. Serve slightly warm. Place butter in the bowl of a freestanding mixer (or large bowl if using a handheld mixer). Using the whisk attachment, mix at high speed until the butter is light and fluffy (about 2 minutes). Add the honey, maple syrup and cinnamon. Mix to fully combine. Store in a sealed container in the refrigerator until using. Cook on low for 6-8 hours, or high for 3. Serve on buns, with pickles or additional fixins. Preheat the oven to 350 degrees F. Line two baking sheets with parchment paper, or spray your Whoopie Pie Pan with baking spray. In a separate bowl, whisk the brown sugar and oil together until well combines. Add the pumpkin puree and whisk to combine thoroughly. Add the eggs and vanilla and whisk until combined. Use a small ice cream scoop, I used a 1/4 c measuring cup, to drop heaping tablespoons of the dough onto the prepared baking sheets, about 1 inch apart. Bake for 10 to 12 minutes, until the cookies are just starting to crack on top and a toothpick inserted into the center of a cookie comes out clean. Remove from the oven and let the cookies cool completely on the pan while you make the filling. The whoopie pies will keep for up to 3 days, on a parchment-lined baking sheet covered with plastic wrap, in the refrigerator – like they’ll last that long! The African penguin is a species of penguin that can only be found in southern African waters. It has been called the "jackass" penguin because of its donkey like bray. This penguin can be I.D.by its distinctive pink patches of skin above the eyes and black facial mask. The upper parts of the African penguin is black and its underparts are white. The African penguin is a pursuit diver and feeds primarily on fish and squid. At one time there were a great amount of this species of penguins but today it is on the endangered list. There are a few reasons the African Penguin is declining in number. The mid-20th century saw penguin eggs being considered a delicacy food and were collected by poachers to sell. The egg would be smashed so that only fresh ones would be sold. Oil spills also endangered the penguins. Shipwrecks and cleaning of tankers while at sea made African penguins susceptible to pollution of their habitat. Competition among commercial fisheries of sardines and anchovy have forced the penguins to search for other prey off shore. Recent studies of closing known areas of African penguins to fisheries for periods of time showed great benefits to penguins No matter the reason of declining numbers I pray that the African Penguin never goes extinct. Their beauty can never be replaced. Recently at a community party we met a lady pretending and dressed up like a psychic. She was a good friend of mine as well as a co-worker. For this night though she was Madame Zola. I talked my grand-daughter into getting her fortune read. Only this did not work real well. The first attempt she walked in and then right back out. The second time I went with her and she sat down and listened for maybe 3 minutes. During this time Madam Zola told her she was a smart little girl who could make good grades in school and she would make a new friend soon. Nothing that should bother her. She abruptly got up out of the chair and walked no I would say ran out. I later asked her why and she told me "Maybe I don't want to know everything that is going to happen to me". Would you like to have your fortune told to you?? Fortune telling is basically the practice of predicting events and happenings about a person's life. Fortune telling is very much like divination (the practice of seeking knowledge of the future or the unknown by supernatural means.) It is however hosted in a less serious or formal setting. Civilizations of different cultures have become interested in matters of fortune telling throughout history. 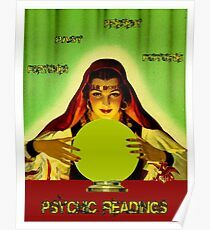 Psychics have been sought to tell fortune through astrology, numerology, and tarot. Fortune telling emerged originally from Renaissance magic interrupted via gypsies. Fortune tellers can use many hundred different techniques. Many of these techniques date back to before recorded history. These forms are the same that were practiced in ancient China, Egypt, Chaldea, and Babylonia dating back to 4000 BC The bible in fact tells stories of prophetic dreams and oracular utterances. During the 19th and 20th century methods of divination from non-Western cultures were adopted as methods of fortune telling in western popular cultures. Every culture seems to have its own form of fortune telling. Astrologers and wizards were consulted for everything from battles, to political matters as well as marriage choices. Astrologist were said to be able to study the movements of heavenly bodies as they influenced matters on earth. Those who professed in numerology would use playing cards, tarot card, tea leaves, crystal balls, dice, fire, water and scattered salt. Fortune tellers would use character analysis , study of handwriting, physiognomy or studied facial characteristic as well as palmistry. 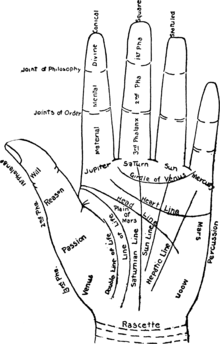 Palmistry is study the hand of the one searching for their fortune to be told. Many Europeans and Americans consider fortune telling as a sin within Judaism and Christianity and civil laws that have forbidden the practice of such magic. Thousands of years ago psychics were prized advisers but they have since lost respect and reverence. October is the month that helps to draw attention to Breast Cancer Awareness. Right in the middle of the month of October another awareness day occurs. National No Bra Day is celebrated on the 13th of October. Millions of women will participate and leave their bras at home to promote the cause of breast cancer awareness. This special day is to help remind women that they should be screened for breast cancer on a regular basis. It is also a day to raise funds for research. The No Bra Day is to help support women who have survived breast cancer and can no longer go without wearing a bra. They need a daily bra to help hold up their prosthesis after undergoing surgery. National No Bra Day first occurred in Toronto Canada in 2011. A plastic surgeon named Dr. Mitchell Brown created Breast Reconstruction Awareness (BRA) Day. It is a day to educate patients about mastectomy surgeries and choice of reconstruction. This great day spawned National No Bra Day on October 13th that occurs in the United States. In the United States alone 1 out of every 8 women will be diagnosed with breast cancer. There are nearly 3 million breast cancer survivors that live in the U.S. Those are the lucky ones that have had this terrible disease as breast cancer is the second leading cause of death among women in the U.S. An estimated 40,000 women will die every year because of breast cancer. It is also the #1 diagnosed cancer in women. An estimated 300,000 women will be diagnosed with breast cancer. Somehow together we must find a way to fight Breast Cancer as too many lives world wide are being affected by this terrible disease. October 13th is celebrated as World Egg Day. Promoting the benefits of eggs is something that happens world wide during this special day. No Yolk eggs are exactly what they are cracked up to be. The only draw back of eggs may be high cholesterol. Eggs are high in nutrition and low in fat and are enjoyed by individuals world wide. Add eggs; cook, over medium heat, stirring frequently, for 2 to 3 minutes, or until eggs are set. Top tortilla with egg mixture, turkey bacon, and pepper (if desired). 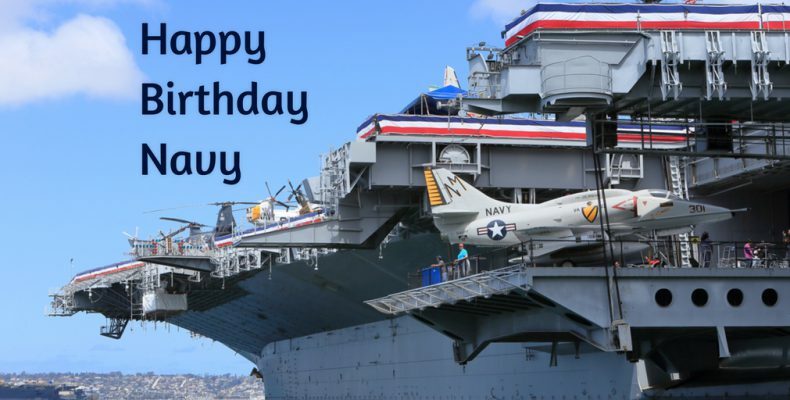 With several family members who have belonged to the military navy I must wish the Navy a Happy Birthday. The Navy was established in 1775. The start of the Revolutionary war, the United States did not have a full time navy. The defense of America's coastline was left for the Navy of Massachusetts to take care of. The need of a national navy was decided by the Continental Congress. The discussion of need or not saw a few different sides (1) national navy better job protecting, shipping and defending the coast (2) There was no way that a navy could be established that could compete with the British Royal Navy. George Washington would decide that the schooner, USS Hannah would be set to sail on October 13, 1775. The Continental Navy would be disbanded at the end of the war and another 10 years would pass before the United States navy would be reestablished. Pirates would openly attack the United States October 1797 the Naval Act would be established. This act would structure the navy as it is now known. Three ships The USS Constitution, USS United States and the USS Constellation would be in service. The Navy birthday of October 13 was established in 1972 by Naval Operations Admiral Elmo R. Zumwalt. The day is designed to celebrate current naval members, former naval members, and dependents of both active service and retired members. The Navy Birthday is celebrated with a grand ball. Trim leaves off whole cauliflower and cut base flat so it sits upright. Rub over generously with olive oil and spices. Pour 1/2 cup of white wine into an ovenproof, glass pie pan and place cauliflower in pan. Sprinkle on salt and pepper. Cover tightly with foil and bake at 300 F for one-and-a-half hours. Check after one hour and brush on more olive oil if cauliflower seems dry. Slash the stems and steam the cauliflower for about 30 minutes or until tender. 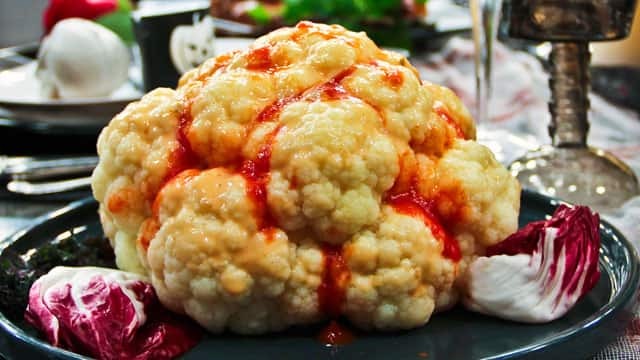 Spoon a creamy pink dressing over the cauliflower. Using a squeeze bottle, squeeze tomato sauce to represent veins on the brain, or pour tomato sauce to represent a large hemorrhage! 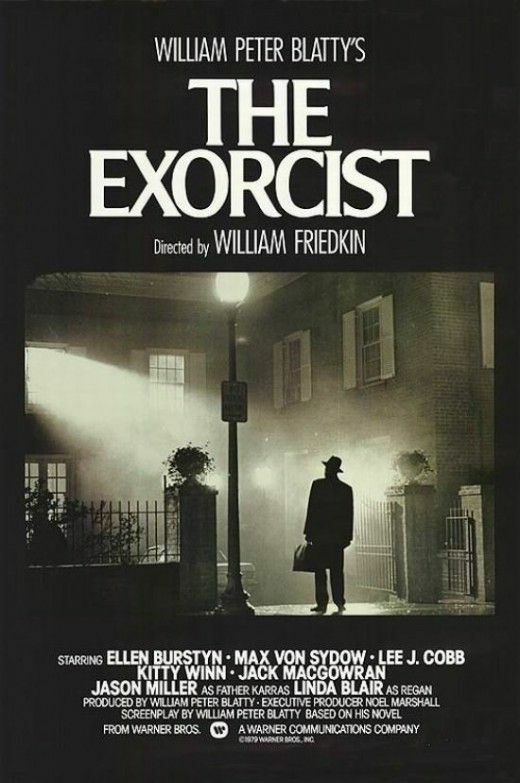 Friday the 13th has long been considered a unlucky day. There are others that are optimistic and choose to shrug off the superstition and go buy lottery tickets with the number 13 in it. 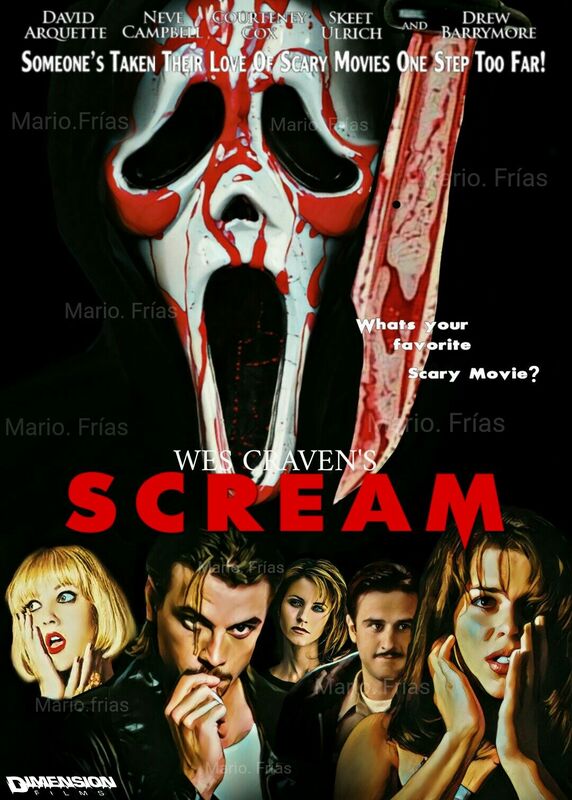 Perhaps it was the movie Friday the 13th that has influenced and made believers in the fearfulness of this day. 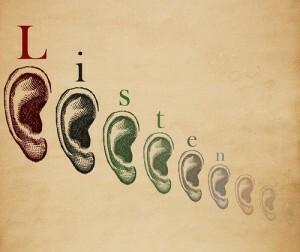 What do you say?? Does Friday the 13th bother you?? tables are not normally made to allow 13 people. At restaurants when 13 individuals are in one party there will be 2 tables set up. The ancient Babylonian code of Hammurah omitted #13 in list of laws. The list was wrote in 1,700 B.C. 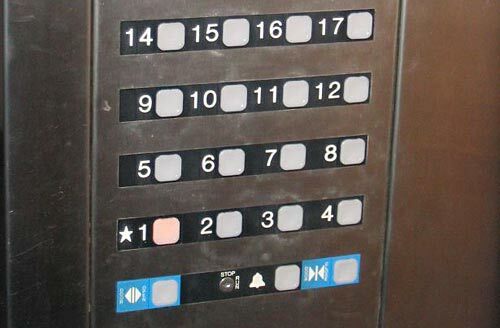 They believed the number 13 to be unlucky. The number 13 has had a bad reputation for centuries. Some have referenced The Last Supper as the most famous example of the ominous nature of the number 13. The disciple who betrayed Jesus, Judas, was the 13 th person to take a seat at the table. The crucifixion of Jesus Christ is said to have taken place on a Friday (thus the celebration of Good Friday). 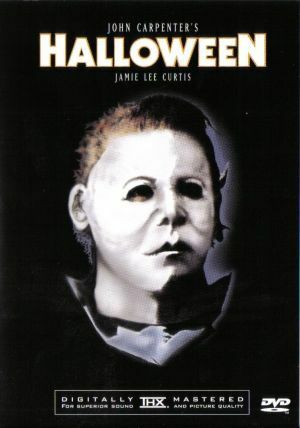 This, coupled with the 13 people present at the last supper, give Friday the 13 th an added weight in scores of cultures. Whether or not 13 is lucky or unlucky or just as ordinary as any other number may never been known. All we have is our opinions. What is your opinion?? A fire start with just a spark but in seconds it can be in a full fledged blaze. That is why it is important to know what to do if a fire were to occur. It can mean the difference between escaping the fire safely or having lives ended tragically. This week has been Fire Prevention Week. The theme for fire prevention week 2017 is "Every Second Counts: Plan 2 Ways Out!" Everyone should know how to get out if a fire were to occur. A fire escape plan is a needed item to keep family safe. Two exits should be I.D'd for each room. A path to the outside from each exit should be planned as well. The plan should be practiced twice a year, one of which should occur at night. Children should know how to escape as well. Make sure your house number is clear from the street. This will help the fire department to find you. There have been times that we have been looking for a house number and there not be one, it be behind a tree or bush and unable to see or part of the street number missing. 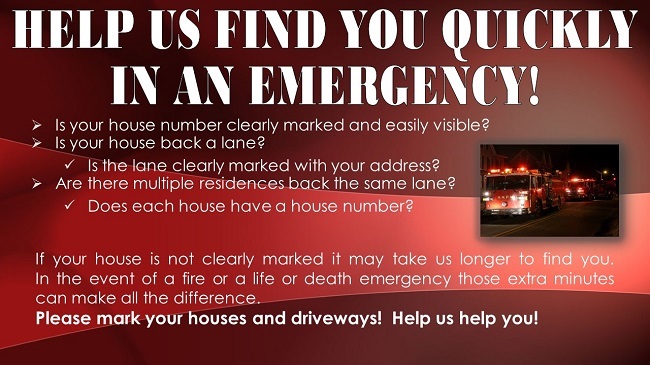 If the fire department can not find your house number it may take time to help you in your time in need. 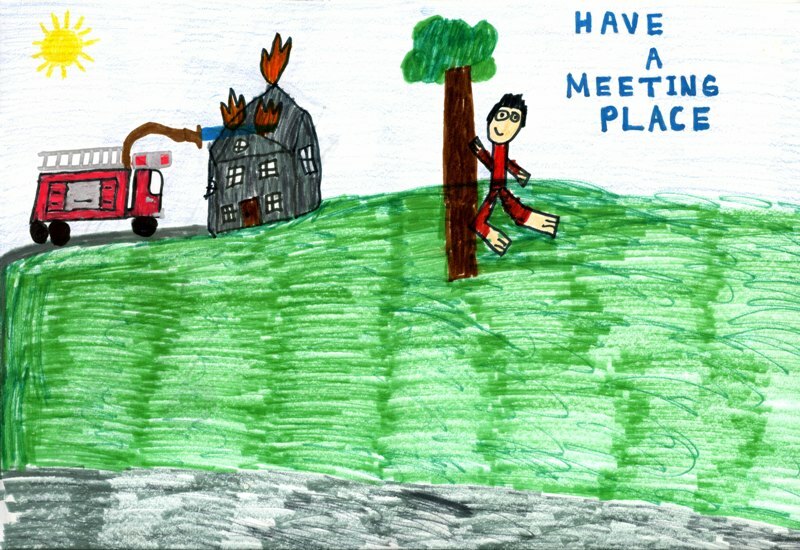 If you recall in fire drills in school when you are leaving out of a burning house be sure to close the door behind you. 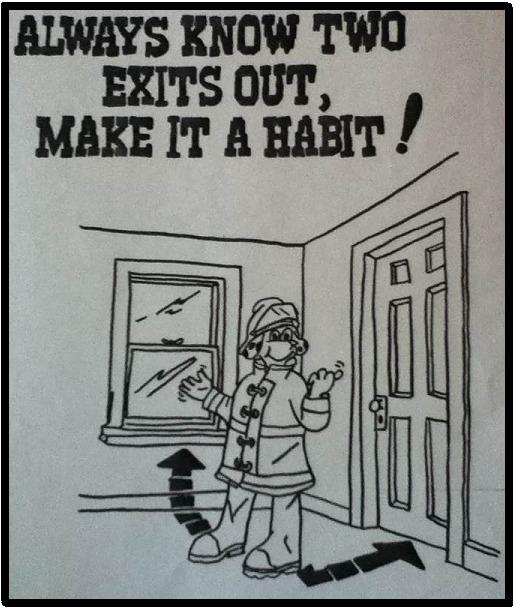 This may be hard to remember in the confusion of the moment but closing the door may help slow the spread of smoke, heat and fire. I am a gluten for punishment sometimes. 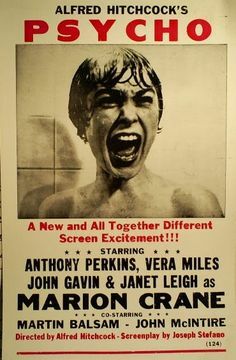 I know that horror movies will scare me to death and yet I will watch them with the adult members of the family every time. Here is a list of some of their favorites. 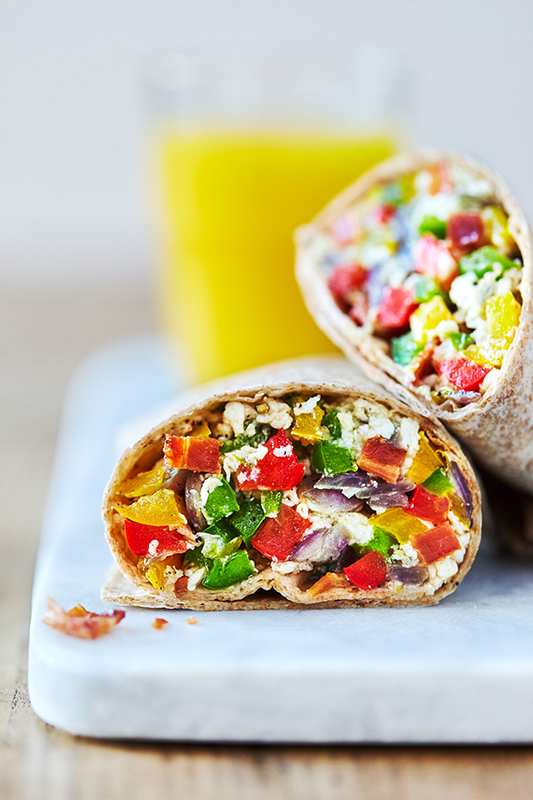 Combine all ingredients in an extra large bowl (or divide between two bowls). Mix well and serve! One important thing to do is to supply the car. Find a place in your trunk to place things you may need if something was to go wrong on a cold winter day. Inside the trunk in your special place should be items such as a flashlight, road flares, a first aid kit, a few blankets, change of warm clothes, extra pair of gloves, a radio, charged cellphone so you can call for help, bag of sand, ice scraper and snacks. Each item has their own job to do and is needed. Prepare your car for winter. Your engine coolant and antifreeze levels should be checked. Antifreeze is needed so your engine will not freeze. You can get a kit to check your own engine coolant or any service station should be able to do this for a cost as well. My answer to this is a 6 I can find my way back very often but not under the circumstances offered but I am way better than #1 as I can find my way an area. Yesterday I worked and where I work I am a floor supervisor. It was if Satan was trying his best to ruin my day and eventually he did. from fellow employees not wanting to work together to my boss coming down on me hard. The word for yesterday was horrible. No it is not a typical day but it does happen from time to time. 3. Time, money, water-power resources, opportunity .... which one on the list are you most guilt of wasting?? What might you do to change that?? My family did take a great variety of vacations.One or two was to Rock Home Gardens it is simply beautiful there. We once took a vacation to cloud 9 ranch but ended up not staying at the ranch that was truly several mobile homes together. There were trips to the zoos, fairs and so many other things that we did to have fun. 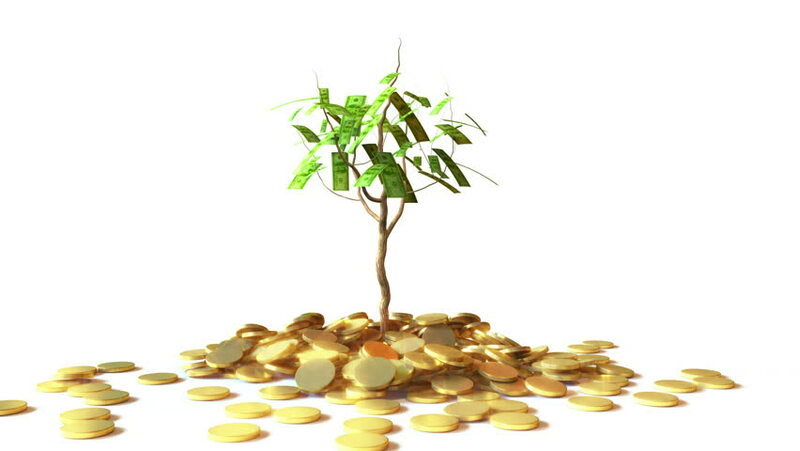 If I could grow anything I believe I would plant a money plant so it could grow dollar bills for me. In reality we tried some plants this year and they are doing quite well. I originally came from a small quaint town that went by the name of Whitehall Illinois. It is located in Greene County. 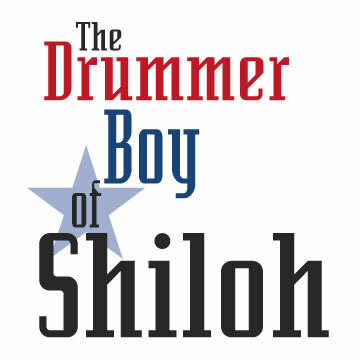 I have always found interest in the story of the "Drummer boy of Shiloh" The story of a boy who would choose to do battle after playing is drum. A young boy by the name of Edward L. Hager grew up in White Hall Illinois would choose to grab a musket during the heat of the battle. He had enlisted on November 13, 1861 in Carrolton, Illinois and join the Company 61st Illinois infantry. As a member of the band, fife and drum corp he could enter the war at the age of 16 years old. On April 16, 1862 Pvt. Edward L. Hager was mortally wounded and returned to White Hall to die May 30, 1862. I would have chose to hug this young drummer boy or any of the vets past, present and future to thank them for all that they have done for this great country. I pop the baking sheet in the freezer for a few minutes to cool them off, or leave on the counter to cool. Cream sugar and oil. Add eggs one at a time, beating after each egg. Add combined dry ingredients, alternating with water. 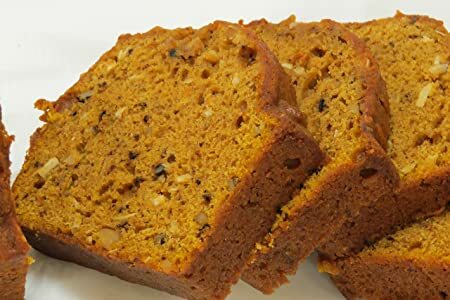 Stir in pumpkin and nuts. Cook in two large greased loaf pans at 350 for one hour. So, what do you think? Are you a pumpkin fan? If so, what is your favorite pumpkin recipe? OCD is more than being neat, tidy, clean and organized. It is having the compulsion to be that way all the time. Obsessive Compulsive Disorder is a serious debilitating disorder that can lead sufferers to having unwanted debilitating thoughts that can harm their day to day lifestyle. It can become in other words a living nightmare. OCD awareness week occurs during the week of October 8th to the 14th in 2017. During the week the goal will be to help raise awareness and help others understand about what OCD really is. 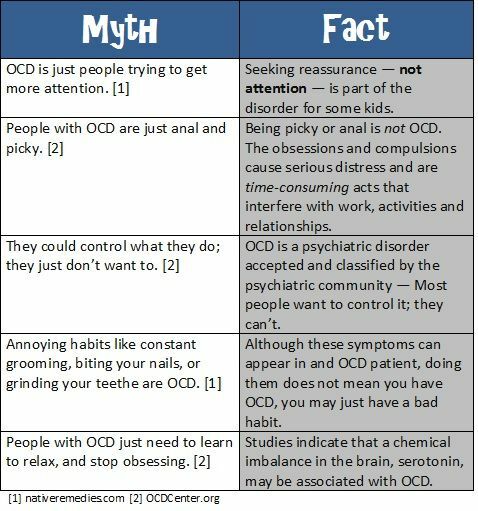 The goal of educating others and ruing out misunderstanding and stigma that can be caused by misrepresentation of OCD. The Awareness week originally began in 2009.